Phenol, also known as carbolic acid, is an aromaticorganic compound with the molecular formula C6H5OH. It is a white crystallinesolidthat is volatile. The molecule consists of a phenyl group(−C6H5)bonded to a hydroxyl group (−OH). It is mildly acidicand requires careful handling due to its propensity to cause chemicalburns. Phenol was first extracted from coal tar,but today is produced on a large scale (about 7 billion kg/year) from petroleum.It is an important industrial commodity as a precursor to many materials and usefulcompounds.It is primarily used to synthesize plasticsand related materials. Phenol and its chemical derivatives are essential for productionof polycarbonates,epoxies,Bakelite,nylon,detergents,herbicidessuch as phenoxy herbicides, and numerous pharmaceutical drugs. Although similar to alcohols, phenols have unique properties. Unlike alcohols,where the hydroxyl group is bound to a saturated carbon atom,phenols have thehydroxyl group attached to an unsaturated aromatic (alternating double and single bond)hydrocarbonbenzene ring. Phenolshave greater acidity than alcohols because of the stabilization of the conjugatebase through resonance in the aromatic ring. Acetoneis produced as a by-product. Compared to most other processes, the cumeneprocess uses relatively mild synthesis conditions, and relatively inexpensiveraw materials. However, to operate economically, there must be demand for bothphenol, and the acetone by-product. In the Lummus Process, theoxidation of toluene to benzoic acid is conducted separately. Phenol is also a recoverablebyproduct of coalpyrolysis. The major uses of phenol,consuming two thirds of its production, involve its conversion to precursorsfor plastics. Condensation with acetone gives bisphenol-A,a key precursor to polycarbonates and epoxide resins.Condensation of phenol, alkylphenols, or diphenols with formaldehydegives phenolic resins, a famous example of which is Bakelite.Partial hydrogenation of phenol gives cyclohexanone,a precursor to nylon.Nonionic detergentsare produced by alkylation of phenol to give the alkylphenols,e.g., nonylphenol,which are then subjected to ethoxylation. Phenol is also a versatileprecursor to a large collection of drugs, most notably aspirinbut also many herbicides and pharmaceutical drugs. 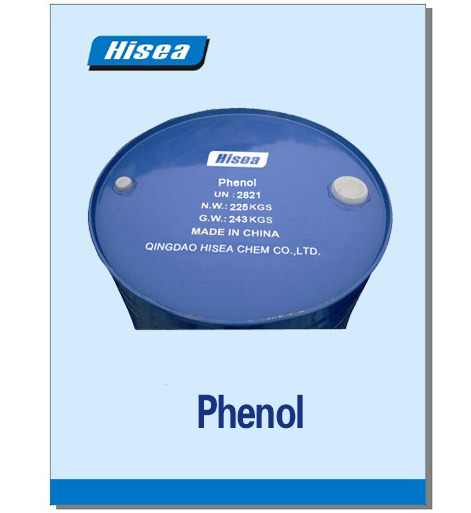 Phenol is also used as anoral anesthetic/analgesic in products such as Chlorasepticor other brand name and generic equivalents, commonly used to temporarily treatpharyngitis. Phenol is a component in liquid/liquid phenol–chloroform extraction techniqueused in molecular biology for obtaining nucleic acidsfrom tissues or cell culture samples. Depending on the pH of the solutioneither DNAor RNAcan be extracted. Phenol is so inexpensive that itattracts many small-scale uses. It once was widely used as an antiseptic,especially as carbolic soap, from the early 1900s to the1970s. It is a component of industrial paintstrippers used in the aviation industry for the removal of epoxy,polyurethane and other chemically resistant coatings. Phenol derivatives are also usedin the preparation of cosmetics including sunscreens,haircolorings, and skinlightening preparations. Concentrated phenol liquids arecommonly used for permanent treatment of ingrown toe and finger nails, aprocedure known as a chemical matrixectomy.The procedure was first described by Otto Boll in 1945. Since that time it hasbecome the chemical of choice for chemical matrixectomies performed bypodiatrists. Phenol spray is used medically tohelp sore throat.